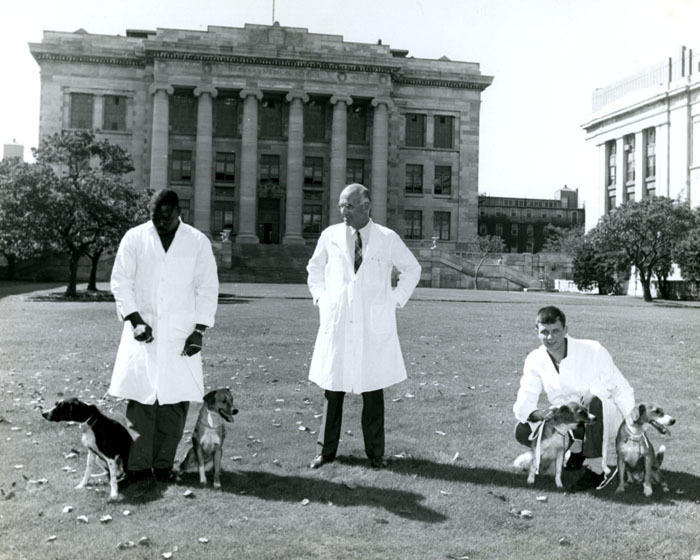 If you are curious about the mise en scène at Boston’s legendary Peter Bent Brigham Hospital during the war years of the 1940s, its transplant breakthroughs of the 1950s, its merger dreams of the 1960s, its spreading out and spreading up through the 1970s, or its post-merger incarnation as the Brigham and Women’s Hospital, in the 1980s and 1990s, then click the links above or these (Brigham Bulletin, Inside AHC, Inside Brigham and Women’s, Inside BWH, BWH Bulletin) and have a poke around the historic staff newsletters. Thanks to the support of the BWH Medical Library, the third and final phase of the BWH Archives Newsletter Digitization Project is complete. The Brigham and Women’s Hospital inside story—every year from 1943 through 1999*—is now online and fully searchable. Exclusively for employees, the newsletters, produced by the Public Relations office about the people, projects, and accomplishments of the hospital, were written in a more intimate style than its other, official publications. The original shop at the Brigham was opened by the Friends of the Brigham in 1944. They sold magazines, candy, toiletries—and tobacco. In May of 1954, a Biophysics Research Laboratory opened at the Peter Bent Brigham Hospital, the first of its kind in a hospital setting. Volunteers wheeled carts stocked with library books and magazines around the hospital for patients to freely choose from, throughout the 1950s. In 1958, the Institute for Contemporary Art added the “Art Cart” which supplied a choice of framed art prints for patients to use for personal enjoyment during their hospital stay. 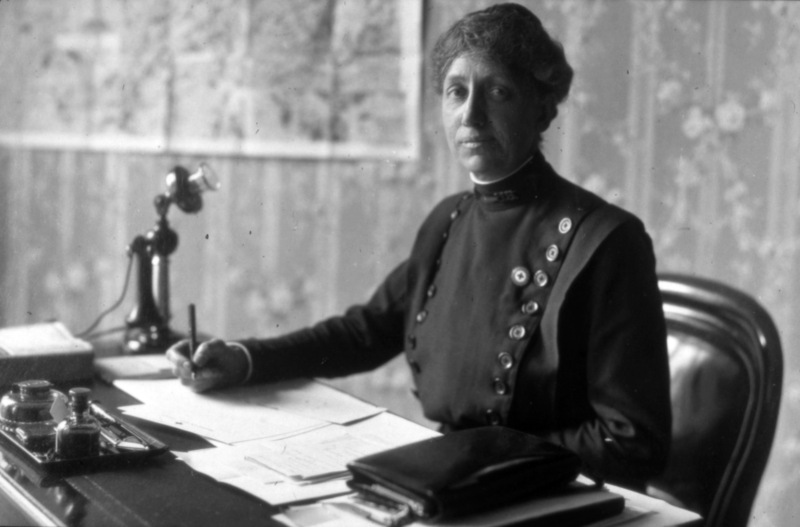 Dr. Victoria Maxwell Cass was the acting Director of the Peter Bent Brigham Hospital from 1957-1958. She had been Associate Director since 1952. In 1960, televisions and radios were added to patients’ rooms. 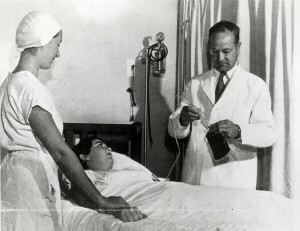 King Saud of Saudi Arabia came to the Brigham for treatment in 1961. His large entourage, including his wives, were given rooms at the hospital so they could stay close to his highness. 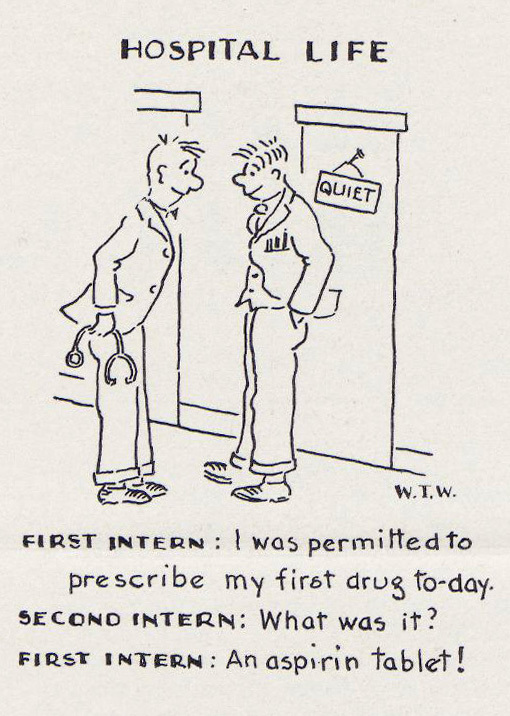 In 1967 the annual stipend for interns was raised from $3200 to $6000. An architect’s early concept design for the hospital called for four short towers clustered around a core (1969) as opposed to the one tall tower that was finally built (1980). The Robert B. Brigham division of the newly merged hospitals started patient registration and billing with computers in 1979. 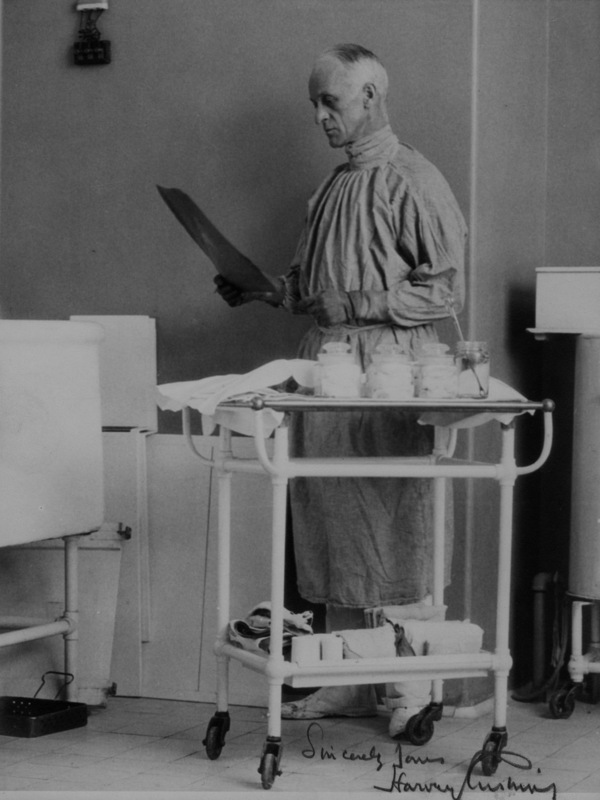 Did you know that the separation of infectious waste for disposal from hospitals was a new idea in the mid-1980s? Before that all medical waste went into landfills. 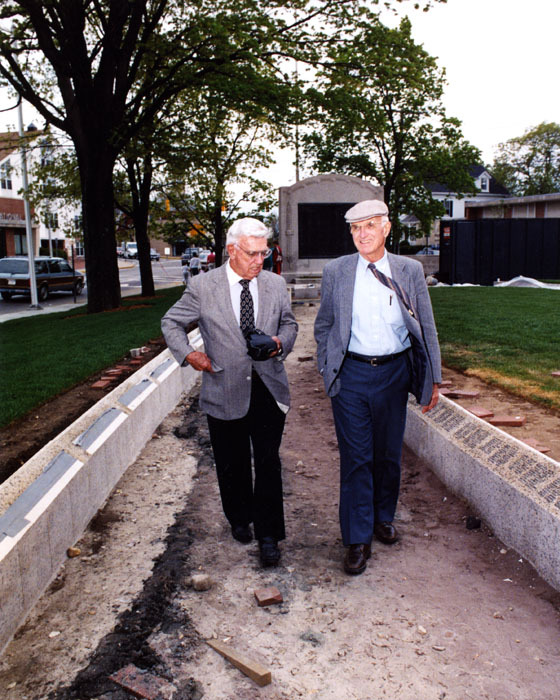 It was 1987 when the then new technology “Magnetic Resonance Imaging” was first put into clinical practice at BWH. The first lung transplant in Massachusetts was performed at BWH in 1990. A 1993 story reported that all babies born around the holidays were sent home from the hospital as little “stocking stuffers”—inside handmade Christmas stockings. This had been an OB tradition since 1980. Ten years ago, BWH began performing DNA-based genetic testing in-house instead of purchasing testing from external labs. BWH started bilingual phone answering in 1995. In 1996, BWH got its own helicopter landing pad. 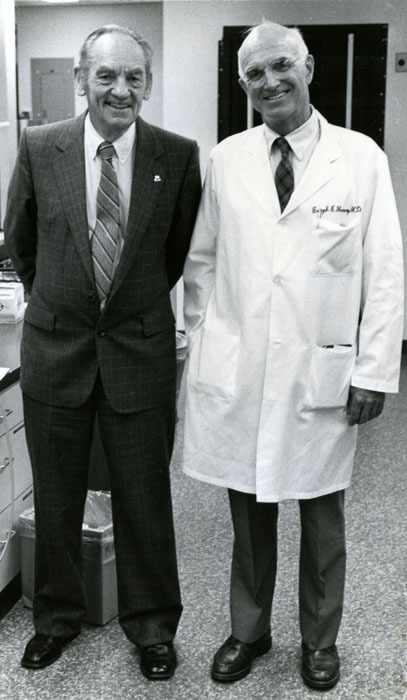 Astronaut and US senator John Glenn, then age 77, came to BWH’s sleep lab for tests prior to his return to space aboard the shuttle Discovery, in 1998. What interesting things can you discover in the newsletter archive? *The BWH Bulletin has been published online since 2000. 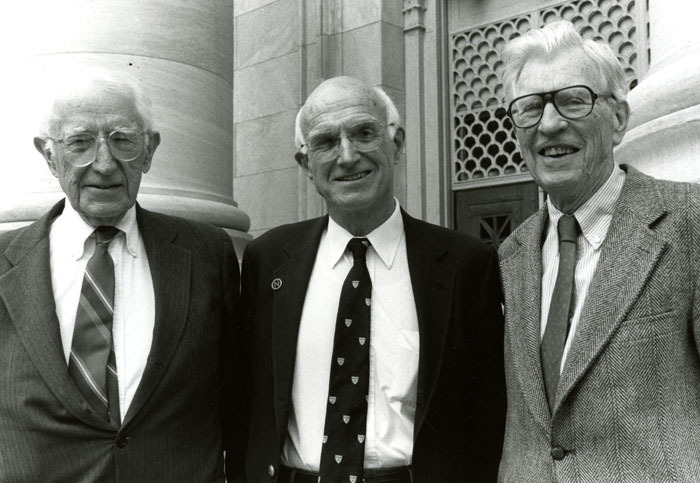 The digitized paper collection, 1943–1999, will always be available via Hollis, the Harvard Library catalog and via links on the BWH Archives page on the Countway Library site. 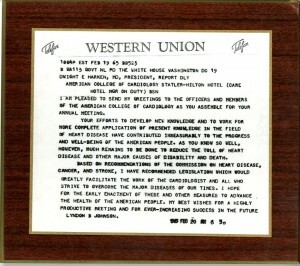 Western Union Telefax from President Lyndon B. Johnson to Dwight E. Harken, President of the American College of Cardiology (ACC), 19 February 1965, thanking the officers and members of the ACC for their immeasurable contribution to the "progress and well-being of the American people," and announcing the President's recommendation of legislation to "greatly facilitate the work of the cardiologist..."
The Center for the History of Medicine is pleased to announce that processing of the Dwight E. Harken papers is now underway. 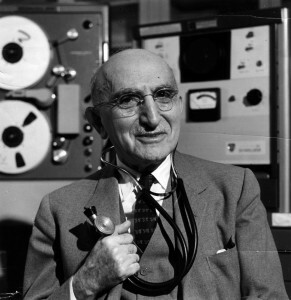 Harken (M.D., 1936, Harvard Medical School) was Chief of Thoracic Surgery at the Peter Bent Brigham (PBBH) and Mount Auburn Hospitals, Clinical Professor of Surgery at Harvard Medical School, and a pioneer in cardio-thoracic surgical technique, medical instrumentation technology, and post-operative patient care. 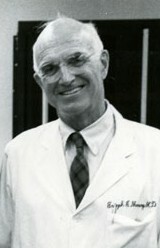 While serving in London with the United States Army Medical Corps during World War II, Harken established his reputation as the first surgeon to perform consistently successful operations upon the interior of the heart when he removed shell casings, bone fragments, and other foreign bodies from in and around the hearts of 134 soldiers without a single fatality. Back in Boston following the war, he worked to adapt his technique for the treatment of mitral stenosis – cardiac valvular disease characterized by the tightening of the mitral valve, which regulates the passage of blood from the left atrium to the left ventricle. The first finger fracture valvuloplasty (a technique and term coined by Harken) was performed in June of 1948; by June of 1956, one thousand mitral valvuloplasty operations had been performed by Harken and his surgical team. 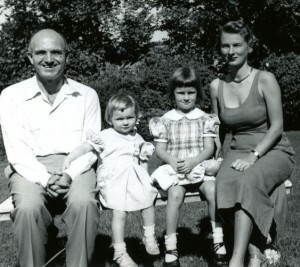 On March 10, 1960, Harken achieved another first when he inserted a prosthetic aortic valve directly into a human heart at the site of the biological valve; the prosthesis was the first of several designed by Harken throughout his career. He was also the first to insert an implantable demand pacemaker – a device designed to avoid interference with the heart’s own natural electrical impulses by kicking in only when the heartbeat falls outside of a predetermined range. 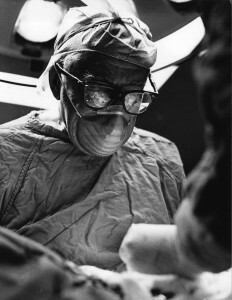 In addition to these and innumerable other surgical accomplishments, Harken pioneered the concept of the modern intensive care unit, the first of which opened at PBBH in 1951. He was also an early critic of tobacco smoking as a cause of lung cancer and heart disease. His papers reflect the diversity of his career within the field of cardio-thoracic medicine and illuminate the first decades of success in heart surgery. 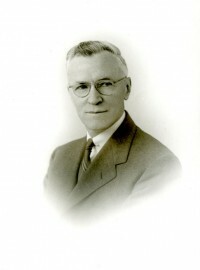 The collection consists of records generated during Harken’s appointments in the United States Army Medical Corps and at Harvard Medical School, Peter Bent Brigham Hospital (a predecessor of Brigham and Women’s Hospital), and the Mount Auburn Hospital, including his surgical notebooks, correspondence, research, writings, publications, professional activities, photographs, and audio-visual materials. The collection is currently scheduled to open in early 2014. 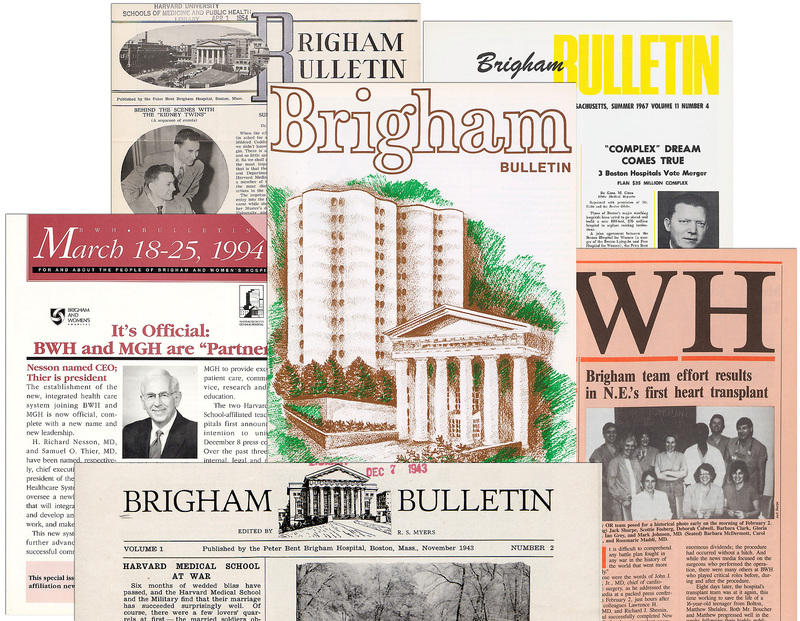 View the newly digitized issues of the Brigham Bulletin. “Hail! A New Baby is Born!” With that announcement on its front page, the very first Brigham Bulletin was inaugurated in the summer of 1943. The newsletter was conceived as a way of keeping Brigham staff who were serving in the armed forces during WWII informed about goings on at the hospital. Publication of the Brigham Bulletin stopped with the end of the war, but it was brought back by popular demand in 1950. There has been a hospital Bulletin published in one form or another ever since. The Brigham and Women’s Hospital Archives has made another portion of our collection of 60+ years of hospital newsletters available online, the latest covering the war years and the 1950s. 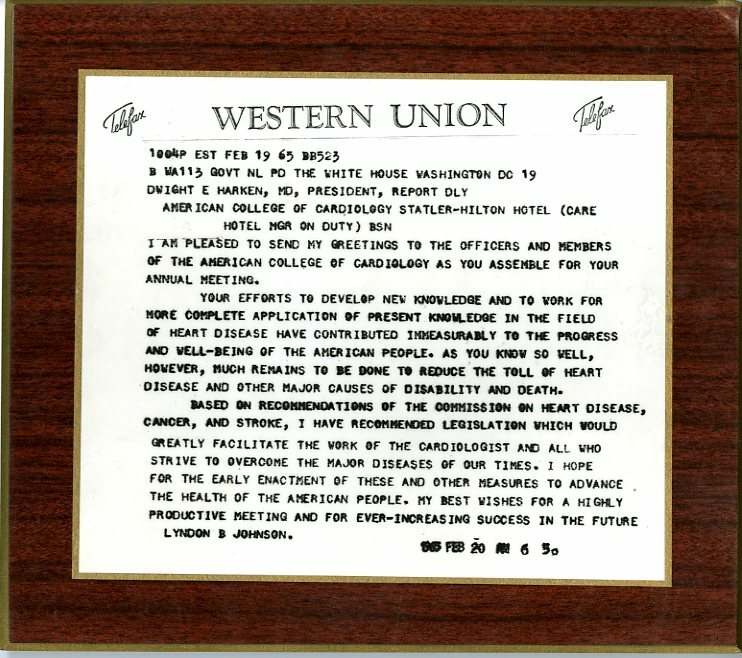 Thanks to the financial support of the Brigham and Women’s Hospital Physicians Council for our Newsletter Digitization Project, these earliest Brigham Bulletins from the Archives have been added to the 1969-1977 batch digitized during Phase 1 of the project. Did you know that the hospital used to employ a part-time barber? 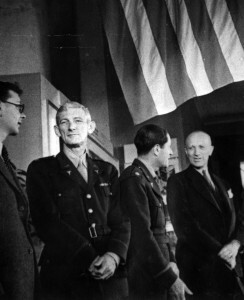 Or that in the 1940s the Peter Bent Brigham Hospital Chief of Surgery, Colonel Elliott Carr Cutler, was promoted to Brigadier General in the US Army and appointed as the Chief Surgeon for the European Theater of Operations? The long hospital corridor, known by the nickname “the Pike,” had been an outdoor path between wards since 1913. Enclosing it began in 1945, albeit with long rows of sunny windows. A Christmas dance was held every year for the nurses. The Brigham installed a high-tech dial telephone system in 1950. This completes Phase 2 of the digitization of hospital newsletters. Two hundred and fifty-five pages dating from July 1943 through the Spring of 1961 are now keyword searchable. 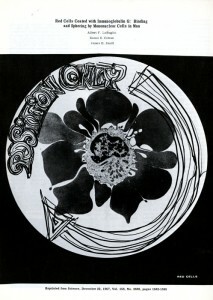 This is a direct link to page 1 of the first Brigham Bulletin: http://pds.lib.harvard.edu/pds/view/42588502 They are also permanently available from within the online Harvard Library catalog (search Brigham Bulletin). "Red Cells Coated with Immunoglobin G: Binding and Sphering by Mononuclear Cells in Man", by James Harriman Jandl, 1967, H MS c383. From the Harvard Medical Library in the Francis A. Countway Library of Medicine. 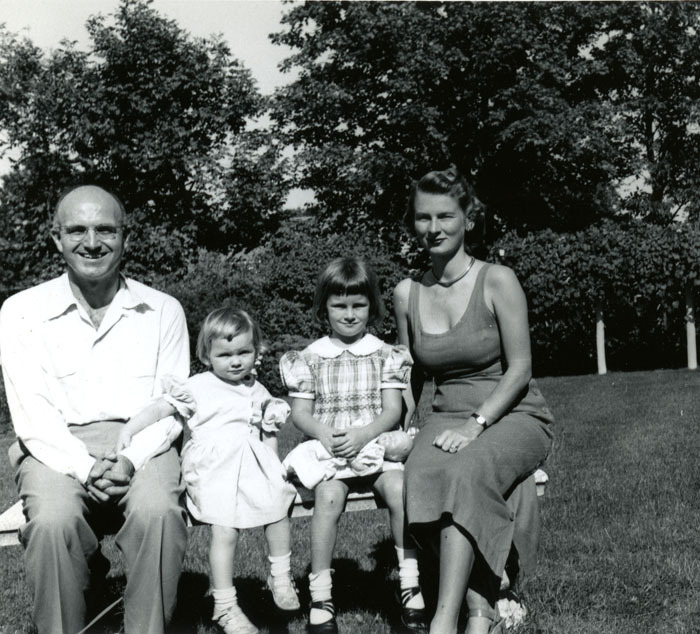 The Center for the History of Medicine is pleased to announce the opening of the James Harriman Jandl papers, 1922-1993 (inclusive), 1940-1993 (bulk). Jandl (1925-2006; B.S., 1945, Franklin and Marshall College, Lancaster, Pennsylvania; M.D., 1949, Harvard Medical School, Boston, Massachusetts) was George Richards Minot Professor of Medicine Emeritus at Harvard Medical School, Senior Physician at Beth Israel Hospital, Boston, Massachusetts, and Senior Consultant in Medicine at Brigham and Women’s Hospital, Boston, Massachusetts. Jandl’s research focused on various aspects of hematology and hematologic disorders, including red blood cell abnormalities and development, hemolytic anemia, blood platelet transfusion, liver disease, and iron transfer between blood proteins and cells. He is credited with discovering the mechanism by which reticuloendothelial cells destroy gamma globulin antibody-coated red blood cells. 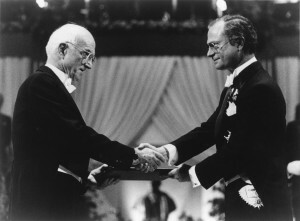 Jandl’s papers are the product of his publishing, research, and professional activities, as conducted throughout his professional appointments at the Thorndike Memorial Laboratory of the Boston City Hospital and Harvard Medical School. The bulk of the papers consist of annotated manuscript drafts, galley proofs, and related publication correspondence for his contributions to various scientific publications related to hematology. Writings concern multiple aspects of hematology and hematologic disorders, including acanthocytosis, hemolytic and megaloblastic anemias, hereditary elliptocytosis, hereditary spherocytosis, polycythemia, red blood cell destruction, and the reticuloendothelial system. Papers also include patient records and charts, research notes and graphs, Harvard Medical School course curricula and teaching policies, collected reprints used for teaching purposes, audio recordings of scientific talks related to hematology, glass slides related to anemia, and a scrapbook of newspaper clippings concerning the Boston City Hospital. Processing of the collection was supported by the Francis A. Countway Library of Medicine’s Charles S. Minot Fund for Hematology. The finding aid is available online. William Parry Murphy, undated, H MS c284. From the Harvard Medical Library in the Francis A. Countway Library of Medicine. 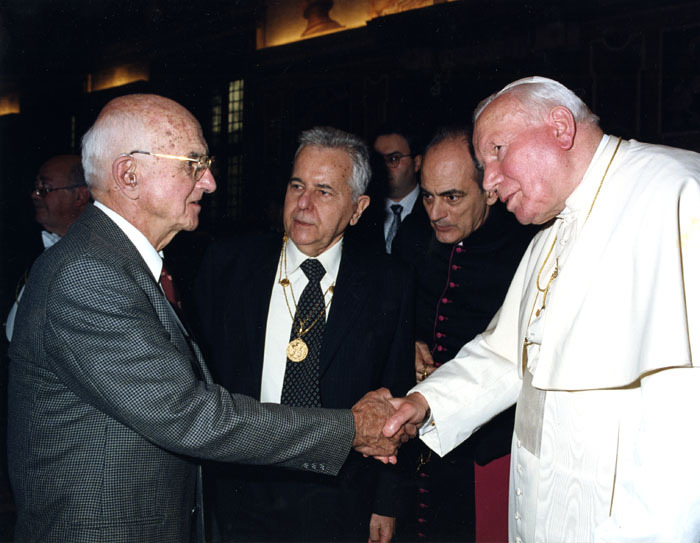 The Center for the History of Medicine is pleased to announce the opening of the William Parry Murphy papers, 1906-1987 (inclusive), 1919-1987 (bulk). Murphy (1892-1987; A.B., 1914, University of Oregon, Eugene; M.D., 1922, Harvard Medical School, Boston, Massachusetts) was Senior Associate in Medicine at Peter Bent Brigham Hospital, Boston, Massachusetts, and Lecturer in Medicine Emeritus at Harvard Medical School, Boston, Massachusetts. Murphy’s research concerned various hematological diseases, notably pernicious anemia, leukemia, and diabetes mellitus. 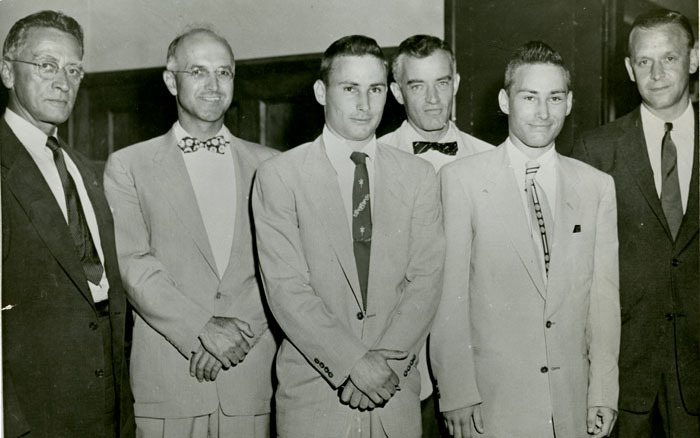 With George Richards Minot (1885-1950) and George Hoyt Whipple (1878-1976), he is credited with developing a treatment for pernicious anemia using a diet of uncooked liver, for which all three were awarded the 1934 Nobel Prize for Physiology or Medicine. 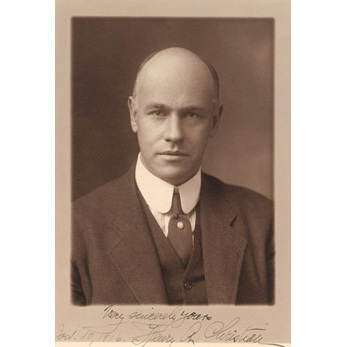 Murphy later worked throughout his career to refine the liver extract developed by Edwin Joseph Cohn (1892-1953) and George Richards Minot for the treatment of pernicious anemia. 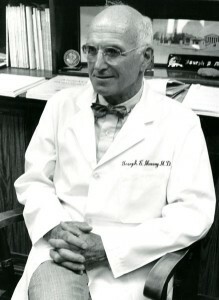 Murphy’s papers are the product of his hematology research on pernicious anemia, leukemia, and diabetes mellitus, and his personal and professional activities throughout the period of his service at the Rhode Island Hospital, Providence, Harvard Medical School, and the Peter Bent Brigham Hospital. The bulk of the papers consist of correspondence regarding his professional appointments, his involvement in professional associations, patient cases, and medical advice to patients and colleagues. Papers also include: research notes on blood disorders, primarily pernicious anemia and liver extract treatment; publications and newspaper clippings collected by Murphy for use in his research and medical practice; personal correspondence with family and friends; a bound copy of his book Anemia in Practice: Pernicious Anemia (1939); manuscript drafts for over forty of Murphy’s scientific papers; and a large number of unlabeled photographs of his family and domestic life, and of Murphy and his colleagues. 1912 Travels of the Medical Staff, Peter Bent Brigham Hospital. 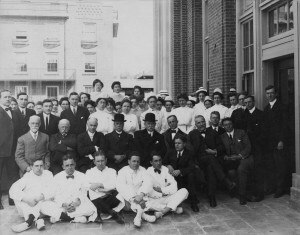 In 1912, as the columns were being raised for the façade of the new Peter Bent Brigham Hospital on Francis Street in Boston, and before the final brick was laid or the plaster dust settled, the first Brigham Physician-in-Chief, Henry A. Christian, worked out a plan for his new staff to take a trip together to investigate the latest medical innovations in European clinics before beginning their official hospital duties. This team, assembled by Dr. Christian, included Francis Weld Peabody, M.D., First Resident Physician; Channing Frothingham, Jr., M.D., Physician; I. Chandler Walker, M.D. Acting Resident Physician; and Reginald Fitz, M.D., Assistant Resident Physician. Throughout the summer of 1912, Drs. Christian, Frothingham, and Fitz toured various facilities across the continent. Dr. Peabody also traveled the continent, but spent five weeks in Copenhagen studying with physiologist, August Krogh (1874-1949). Dr. Walker spent nearly all his time with internist and physiologist, Paul Oskar Morawitz (1879-1936) in Freiburg, Germany. They chronicled their travels and discoveries in diaries that were typed and assembled into an unpublished volume, a few copies of which were given away to their colleagues. 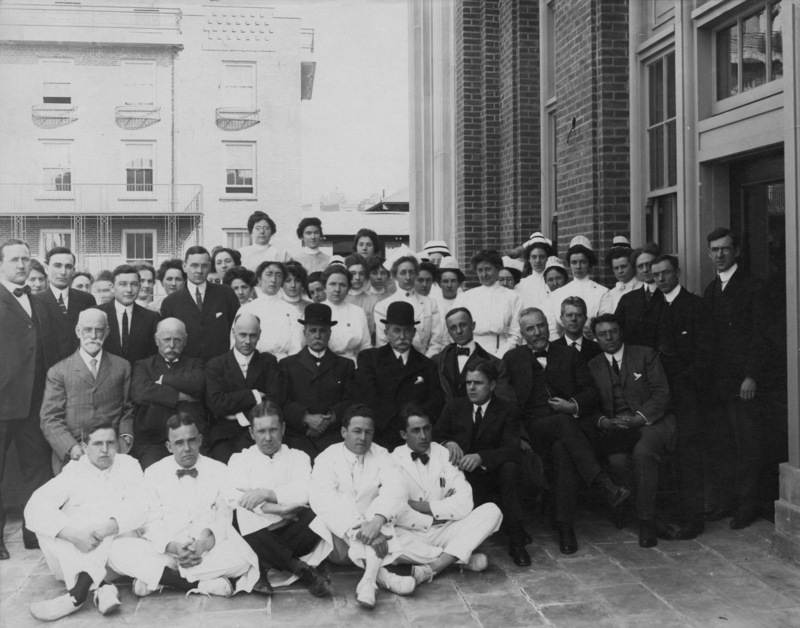 Thanks to a generous donation from Brigham and Women’s Hospital donor, Frederic A. Sharf, the BWH Archives copy of 1912 Travels of the Medical Staff of the Peter Bent Brigham Hospital was recently digitized and made available to the public via the Harvard Hollis catalog.